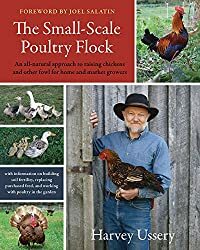 Whether you are just getting started with chickens or have had them for awhile, Harvey Ussery’s The Small-Scale Poultry Flock provides an informative and entertaining read. I originally purchased the book when taking a Pastured Poultry class through UMass Amherst Stockbridge School of Agriculture, and I know it will be invaluable to me as I start raising my own chickens. The book starts with a discussion of food quality, animal safety, and environmental issues of industrial, conventional poultry. Then, Ussery engages readers in a clear and practical explanation of how to raise your own poultry flock. I found the descriptions of each breed and their benefits, including those which are in need of conservation, to be particularly helpful as I prepare to select my first chickens. Spoiler alert: Ussery’s favorite is the Old English Game. Colorful photos and detailed drawings of Ussery’s own poultry house “The Chicken Hilton” provide a clear blueprint of what should be included in poultry housing. Specific dimensions of each component and step-by-step instructions for how to make some of the accessories are included in the appendices. Ussery also encourages the reader to use their imagination when it comes to housing, as long as you’re sure to consider “ventilation, predators, space, and sunlight.” He also provides guidance about chicken tractors (he calls them cruisers) and mobile a-frame shelters. One of my favorite sections is “Feeding the Small-Scale Flock”, in which Ussery first explains the three natural food groups for chickens: green plants, seeds and fruits, and animal foods. Next, he talks about purchased feeds in detail but then inspires the reader to consider making their own feeds. After explaining the benefits and downsides of each ingredient, Ussery shares sample recipes as well as a feed formulation spreadsheet. He then discusses growing crops, sprouting grains, vermicomposting, and solar cooking to create nutritious foods at home for your flock to enjoy. The book also convinced me of the benefits of putting chickens to work, including using “chicken power” to till cover crops or other organic matter into your garden and rewarding your chickens with treats like black soldier fly grubs. While the book is mainly focused on getting started with chickens, there’s plenty of helpful information about ducks, geese, guineas, and turkeys, too. I particularly enjoyed reading about how ducks love banana slugs and guineas are ideal for controlling squash bugs and ticks. If you’re thinking about getting chickens or other fowl or simply want to improve your current flock management, The Small-Scale Poultry Flock is the perfect guide. It will build your confidence not only in caring for your birds but also in integrating them into other aspects of your homestead. The Ussery book has been on my wishlist for a long time because I know I don’t know everything I should know about keeping chickens. Thanks for the chance to win! This books great! It would be nice to have all the info in one place instead of so many blogs. this book would really be helpful as I have just started with Silkie Chickens. I have a flock of 30+ hens…. I’d love to learn how to breed them right on our farm and raise the chicks. Winning this book would be a gift from the poultry gods, as I’ve just finished drawing plans for my first chicken house! We’ve been dreaming of raising our own poultry for some time now. Soon we will be moving back to the country to make it our reality. Winning this informative book will be a great resource in this new adventure of our’s. This book is filled with LOTS of chicken rearing experience I desperately need! I would love to add to my frugal homestead library! Wonderful addition to our poultry library, for a lifetime ! Hope we can pass these on to our future generations in our family, a heirloom. For small flock owners like me, novice or experienced , this book will definitely enhance our knowledge, skills and confidence! I checked out this book from the library but would love to have a copy. I really like Harvey’s insight and his ideas for having a closed system that incorporates things like vermicomposting along with chicken keeping. Growing up, my brother kept chickens. I’ve had chickens on and off for the last 5 years. It’s great to have the eggs, and entertaining to watch them, but a whole lot of work in the winter. This is a very helpful and well-written review. So glad to see that it’s written by an aspiring poultry farmer! Looks like a great book! We are interested in chickens so we can have a source of humanely raised eggs.